Meir Jacob Kister (16 January 1914 – 16 August 2010) was professor of Arabic in the Hebrew University of Jerusalem. M.J. Kister was born at Mościska, Galicia located in modern day Ukraine. At the time of his birth it had been part of the Austro-Hungarian Empire to be annexed by Poland several years later. He attended the gymnasium in Sanok and later the Hebrew gymnasium in Przemyśl. In 1932 he moved to Lwów where he studied Law for one year. Then he lived in Warsaw where he worked for the Rój publishing house that was owned by a family member. In 1937 he became a partner in the publishing house 'Lektura'. Kister came to Palestine in 1939. His parents who had remained in Poland were murdered by the Nazis. In 1940 he became a student at the Hebrew University. Notable among his teachers were D. H. Baneth and S. D. Goitein. As a student Kister prepared translations from Arabic to Polish for the exiled Polish government. In 1945-6 he was a press attaché in Beirut and Damascus for the Polish government. Between 1946 and 1958 he taught Arabic in 'ha-Reali ha-Ivri' school in Haifa. In 1954 he was commissioned to advance the teaching of Arabic in the secondary school level and assembled together with Aḥmad Idrīs a large chrestomathy of literary and historiographical texts known as al-Mujtanā. For his Master’s degree (1949) Kister prepared a critical edition of al-Sulamī's Ādāb al-Ṣuḥba. His doctoral thesis was dedicated to the pre-Islamic history of the Tamīm tribe. Both H.A.R. Gibb and S. M. Stern inspired and supported him in his study. He was awarded his PhD in 1964 at the age of fifty. At the same year he became senior lecturer in the Hebrew University where he had been teaching for several years. In 1970 he became professor. In 1969 he founded the Arabic department in Tel-Aviv University together with Prof. Gideon Goldenberg. He was among the founders of the Arabic department in Haifa University. He retired in 1983. For several years Kister led the Arabic Poetry Concordance project. He founded the periodicals Israel Oriental Studies and Jerusalem Studies in Arabic and Islam. He also initiated the colloquium "From Jāhiliyya to Islam" . In 1971 he published an edition of Balādhurī's Ansāb al-Ashrāf the work on which had begun by Max Schloessinger in the 1940s. In 1975 Kister became a member of the Israel Academy of Sciences and Humanities. 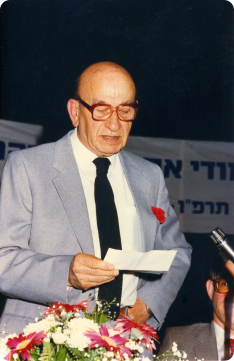 In 1981 he received the Israel Prize. In 1984 he became an external member of the Bavarian Academy of Sciences and Humanities. In 1988 he received the Rothschild Prize in humanities and in 1992 the Hebrew University bestowed on him the Solomon Bublik Award.